The Judgement Tarot Card delivers a message of a time of accomplishment and signals rewards for your past efforts. It is a reminder to sit back and take inventory of your life. A great time to consider of a brand new phase in your life. If you or somebody close to you has had ill health then you can be assured that this card signals a recovery with a new lease of life. 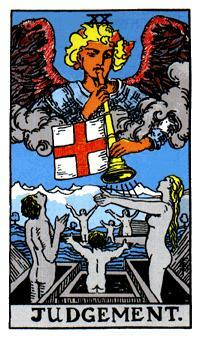 The Judgement Tarot Card brings an opportunity that once received, must not be ignored! This is very important. An upcoming project or decision could change your life for the better and you need to be very mindful of this! This tarot card generally speeds up all events in your life and can help overcome obstacles quickly. Negatively however, this tarot card is a stark warning of obstinacy. Also, one must be mindful of refusal to move with the changes ahead, especially when these changes are essential. There is no need to cause any delays, especially when you have this card on your side. It is a reminder not to be a person experiences fear of nearly everything. These fears include fear of change, sickness and even death. One further negative aspect of the Judgement Tarot Card warns of self doubts and guilt over your mistakes in the past. Do not dwell on these! This will only blur your vision and slow down the journey ahead!